This is a penta-band phone, which sets it away from the pack. You'll get 850/900/1700/1900/2100 HSPA+, along with quad-band 850/900/1800/1900 GSM/EDGE. This is a pretty nice world traveling phone, but if you were looking forward to LTE, you're going to be out of luck there. Wi-Fi? No problem -- 802.11 b/g/n dual-band to give you the most connectivity possible. 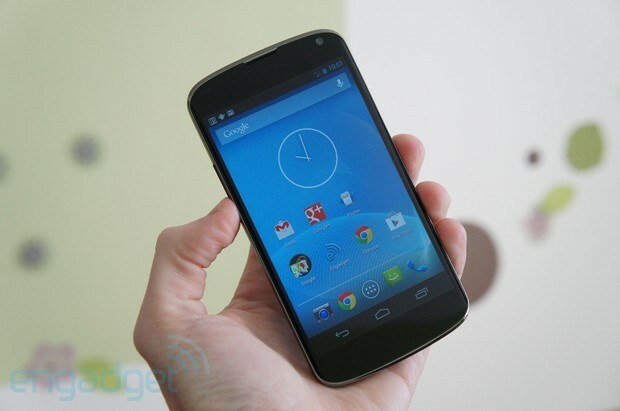 Android 4.2 Jelly Bean will be running on this smartphone, which isn't bad at all. What's new in relation to the Nexus 4 includes the new Quick Settings menu, which gets you access to just about everything: brightness, Wi-Fi, battery life, airplane mode, Bluetooth and even data usage. There's also a link to the settings menu if you need to get deeper under the hood. Google Now integration is also new. Google Now gives you the power to check out local events and news, concerts, attractions, and places for photo opps. You also integrate with Gmail through Google Now, which opens the field for all of your information to be right at your fingertips. Upcoming flight? Google Now politely nags you about it, to make sure that you don't miss a detail. Voice Search also got pumped up as well. You can schedule meetings, figure out when your next appointment will be, and see about other questions that might need to be searched. Voice Search is much more natural than it's ever been -- we're pretty excited about that. Need to magnify something on the screen? Triple-tap it, and there you go -- pan around it using two fingers, or pinch and zoom it to adjust the magnification. Not bad, Google. The camera is probably one of the top things that we're asked about when it comes to the Nexus 4. The user experience has been tweaked, but it might be a little confusing. You get a viewfinder and a sidebar with basic features. However, you can jump into a lot more features by long pressing on the viewfinder. The main camera is an 8 megapixel sensor. It's not as good as what we saw on the Galaxy S III, but it definitely holds its own. Average battery life experienced in the wild has been about five hours -- though some users have reported that they can go all day. It just depends on how you use your phone. You might find that you’re not able to match those numbers exactly, but we figured we'd let you know either way. The Nexus 4 has been available since November 13th in two flavors: 8GB for $299 and 16GB for $349. That's not a bad price for a penta-band world traveling phone -- pop in a micro-SIM card, and you can take over the world. Is this a smartphone that's right for everyone? We're pretty crazy about it but if you're on the fence -- buy it anyway. We're not trying to push you one way or the other, but you have to check this phone out directly. Hold it in your hands and at least test drive it firsthand. Good luck! Previous article:Presentation Ready – Check Out the EasyPPT App! Next article:Slots Social Casino Gets You Deep in The Game – On The Go!